An entertaining big-budget Western, The Westerner helped to establish the genre as a serious venue for bringing to life engaging characters and exploring key themes in the West's progression. It's the 1880s, and large numbers of settlers are arriving in Texas, putting up fences and producing crops to the chagrin of cattlemen who want the country to remain wide open for cattle grazing. 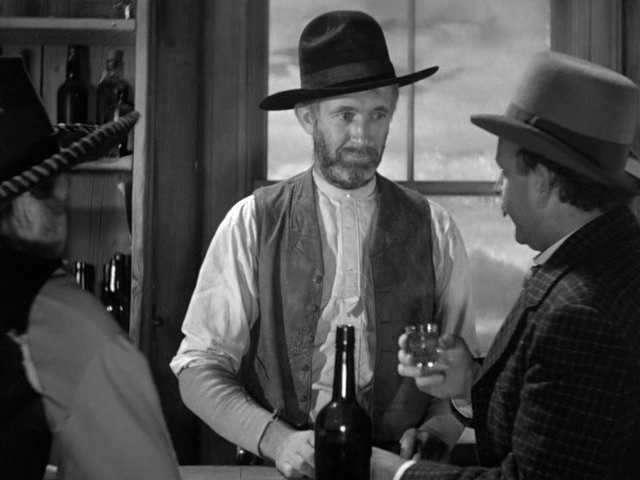 In the small town of Vinegaroon, self-appointed Judge Roy Bean (Walter Brennan) runs the local watering hole which doubles as his courtroom, with his rough, ready and regular customers providing a convenient jury pool. Bean is aware of the shifting social landscape and sides with the cattlemen, refusing to accept that the West is undergoing a fundamental change. He also worships stage performer Lily Langtry, plastering her pictures all over his saloon. California-bound drifter Cole Harden (Gary Cooper) is brought in front of Bean accused of stealing a horse. Harden is innocent, and recognizing Bean's fascination with Langtry saves himself from hanging by spinning long tales of personally having met Lily. Gradually Harden and Bean develop a thorny friendship, despite Harden lining himself up with the settler family of Jane Matthews (Doris Davenport). But when violence erupts and lives are lost in the battle between settlers and cattlemen, the two men are forced to finally confront each other, and matters are further complicated when it is announced that the one and only Lily Langtry will be arriving in Texas for a stage show. A year after John Ford's Stagecoach revitalized the big-budget Western and proved that the genre can indeed be respectable and not just B-movie fodder produced on Poverty Row, William Wyler picked up the challenge and delivered another grand tale of the old West. Drawing inspiration from the life of the real and legendary Judge Roy Bean, The Westerner is a simple story of two resourceful men who discover that as much as they should be friends, the changing times will inevitably push them towards confrontation. The Westerner is a story told with humour, elegance and two fine performances. The screenplay by Niven Busch and Jo Swerling keeps the mood light with plenty of wit and colourful secondary characters. The remarkable but real antics of Judge Roy Bean in self-appointing himself as the law and running a courtroom out of his saloon are genuinely funny, and the film celebrates one of the West's great eccentrics. 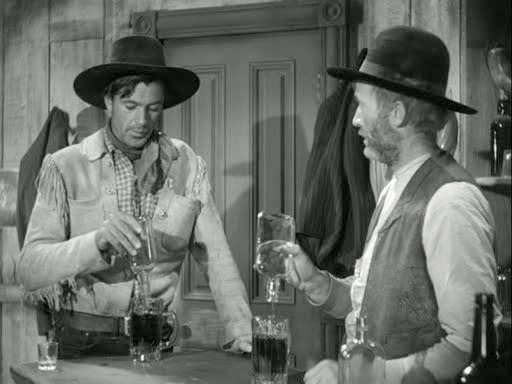 While Walter Brennan won the Best Supporting Actor Academy Award (his third win in five years), his is the film's central performance, and Bean is its most compelling character. In his later years Brennan would become known as the cinematic goofy sidekick, good for a cheap laugh but little else. The Westerner may be his finest performance, as he gives the Judge depth, evil smarts, natural suspicion, and a potent mix of charm and deadly determination. Brennan's protective-aggressive portrayal of Bean's (apparently true) infatuation with Langtry is a particular joy. In contrast Cooper is solid but unspectacular in a role that he only accepted reluctantly and to fulfill his contractual obligation to producer Samuel Goldwyn. Cooper recognized that Cole Harden is strictly second fiddle despite occupying the moral high ground. But The Westerner revealed the special magic that sparkles when Brennan and Cooper are together on the screen, and led to four more collaborations. Despite the prevailing quality, the film is not without its faults. Wyler allows a few scenes to go on for longer than needed, and makes too much of Bean's obsession with obtaining a locket of Langtry's hair, which spills over into a drama between Harden and Jane. But in addition to the two central characters, there is a plenty more going on in the film to compensate, and the tone easily switches to serious when needed. This is the story of the west evolving from wide open and generally lawless to a place where families are settling and hoping to raise children and tend the land. The era of the Roy Beans of the world is drawing to a close, and men like Harden will have more say as the new frontier evolves from rowdy to domesticated. The Westerner will endure, but only by transitioning from wild and carefree to thoughtful and considerate.